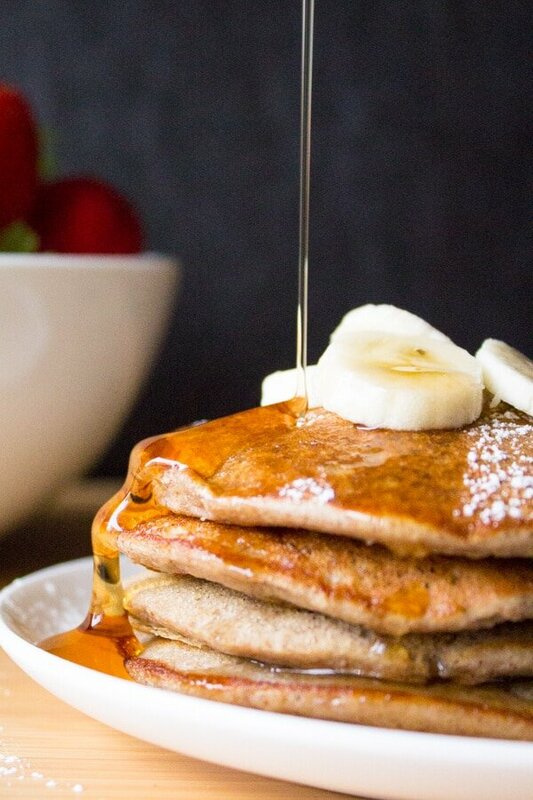 Gluten free, no refined sugars & no dairy or butter – these Skinny Banana Pancakes are guilt-free without having to sacrifice that delicious banana pancake taste! I love breakfast. And I love starting my weekend with a delicious stack of pancakes dripping with maple syrup. This Saturday (which let’s be honest….was no different than any other morning) I wanted something decadent. The only hesitation??? I also just started a 30-day hot yoga challenge and was planning to go to a particularly difficult class not long after breakfast. Hmmmm….. Having a triple chocolate brownie like I did last Saturday probably wouldn’t be the best idea…. So without giving up on my special Saturday breakfasts – I decided it was time for a lightened up pancake recipe. Because I can be healthy. And I can have delicious pancakes. 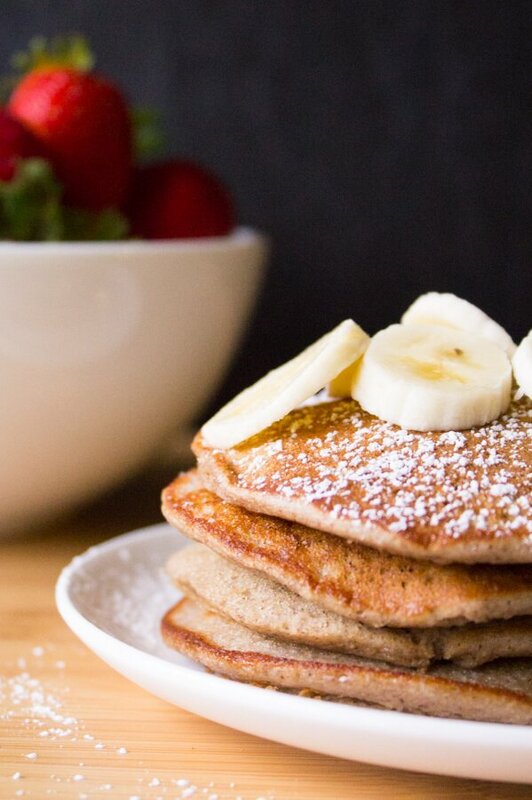 Light, fluffy, filled with all the taste of banana pancakes – you won’t even realize they’re a lightened up recipe! (Look at me – breaking boundaries). But most importantly – they taste delicious. 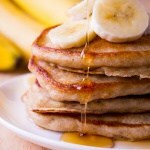 The cinnamon, vanilla & bananas gives these pancakes all the flavor of your favorite breakfast. They’re still fluffy & soft like traditional pancakes, but you don’t have to sacrifice any of your healthy eating to enjoy them. So whether you want a breakfast that’s low-cal or dairy-free, or you want delicious pancakes – this recipe gives you both. Delicious (healthy) pancakes??? Yes please!!!! 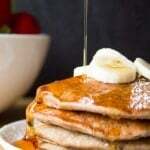 Gluten free, no refined sugars & no dairy or butter - these Skinny Banana Pancakes are guilt-free without having to sacrifice that delicious banana pancake taste! Preheat an electric griddle to 350F degrees or heat a large frying pan on medium heat and melt 1-2 teaspoons of oil in the pan. For each pancake, pour approximately 1/4 of batter onto the pan or griddle. Allow to cook for 2-3 minutes, then flip onto the other side and cook for an additional 2-3 minutes. Serve warm with fresh fruit, maple syrup, peanut butter or plain. Awe! You’re making me blush! 🙂 So glad you like the recipe! I’m a type 2 diabetic who was absolutely craving pancakes. 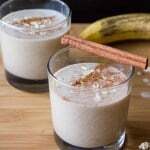 I tried this recipe used agave because it’s lower glycemic and put some natural peanut butter on top. I would say these are a repeat for me! I’ve tried similar recipes to this (in search of delicious things to make for my sugar free, gluten free in-laws), but none have come close to this one in terms of taste, texture, and all-around pancake-y-ness! 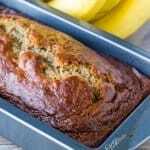 I have also tried it without honey, and with using maple syrup as a substitution, and both variations are delicious too. Thanks for a healthy pancake recipe that I can share with the sensitive tummies in my life! These were amazing. Better cold, they taste like banana muffins. 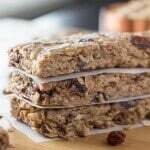 I topped them with a little bit of natural crunchy peanut butter, delicious!!!!! These were absolutely amazing!!! Adding to my keepers book! Thank you so much!